The Stonebrook Nightstand with 3 Drawers by American Woodcrafters at Great American Home Store in the Memphis, TN, Southaven, MS area. Product availability may vary. Contact us for the most current availability on this product. Handles & Hardware Hammered knobs and bail pulls. Case Detail Crown molding, framed drawer fronts. Drawer / Shelf Construction 4-sided drawer boxes with English dovetail joinery in front and back. Drawer interiors are finished to prevent snagging and top drawers feature felt lined bottoms for storage of finer materials. Dust panels on the bottoms of all cases to protect the contents. Drawer Suspension Center- mounted wood on wood drawer guides with drawer stops. Case Construction Mungger solids and segnon tekik veneers. The Stonebrook bedroom collection brings a romantic farmhouse feel to any bedroom. 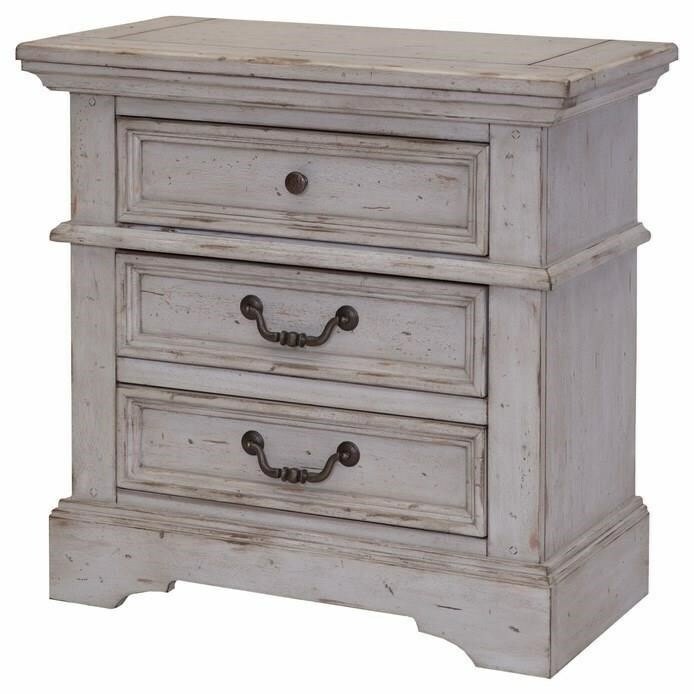 Each piece is defined by thick moldings and an Antique Grey finish that brings a vintage touch. Storage abounds, with sanded drawer bottoms and felt lining on select drawers. Create a bedroom that's charming and elegant with the classic Stonebrook collection. The Stonebrook collection is a great option if you are looking for Traditional furniture in the Memphis, TN, Southaven, MS area. Browse other items in the Stonebrook collection from Great American Home Store in the Memphis, TN, Southaven, MS area.